Online music search and booking platform hosts rooftop artist gala at Holston House hotel with F1 loudspeaker and F1 subwoofer. 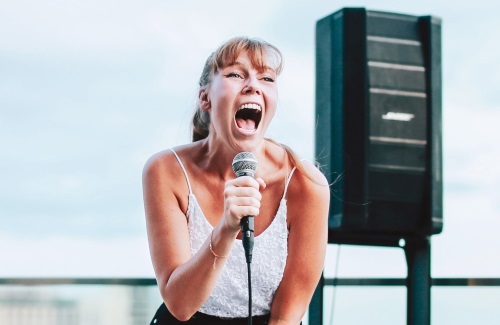 Kirsten Arian performs at EVAmore’s recent gala event on the rooftop of Nashville’s Holston House hotel with the F1 loudspeaker with F1 subwoofer from Bose Professional. Online music search and booking platform EVAmore is a site that creates an online connection between performing musicians and those who need their services with a large and growing array of music artists who are categorized by a number of critical filters. When the company needed to pair its diverse array of music artists with a live sound system for a recent marketing event held on the rooftop of Nashville’s Holston House hotel, they turned to the F1 loudspeaker with F1 subwoofer from Bose Professional. Using EVAmore, event hosts can create free listings, including time, location, budget and requested genres of music. Once created, the event gets pushed out to artists on the platform who meet the specified criteria, creating an open line of communication for musicians who are interested. All messaging and payment is handled through the EVAmore platform, which works with musicians to take care of production and logistical issues. Still, EVAmore’s evening started on an anxious note: the sound mixer the company had hired to mix the evening’s performances canceled at the last minute. Moreland and Stokel quickly called upon Conor Kelly, the guitarist in EVAmore-affiliated act Waker, to see if he could fill in on very short notice. Kirsten Arian, one of the artists who performed at the EVAmore event that night, says the Bose F1 portable PA with subwoofer was a welcome sign for an artist stepping onto an unfamiliar stage for the first time.